When my sister went back from Boracay, they first dropped by Laguna to maximize their vacation and to enjoy some cool Laguna breeze. 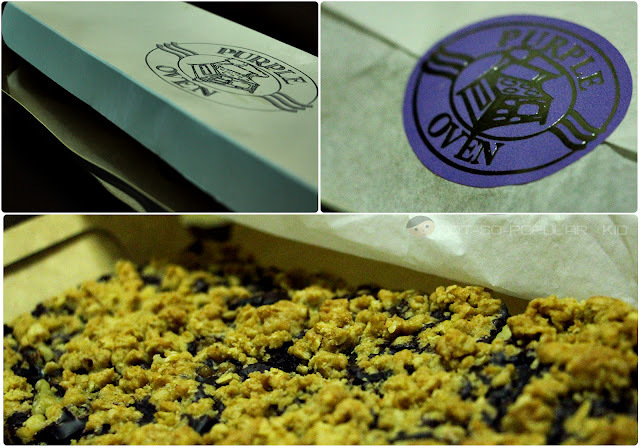 Hence, when my sister came home, she brought us a Revel Bar as a pasalubong from the Purple Oven. This yummy bakeshop called Purple Oven is located in Solenad 2 of Nuvali ,Sta. Rosa Laguna (click on the link to know more about Nuvali and the activities you'll enjoy there). My sister noted that the Purple Oven supplies some of the pastries and cakes of Starbucks! So, she assured us that the quality is really great! With that, I became too eager to try it out, and so I immediately opened up the "cute" yet fancy package. This is what stumbled upon after opening it up (well actually, it was still wrapped in a plastic, which ensured preservation of quality). This Revel Bar according to my sister costs about Php260 with 16 cuts/pieces. So, converting that into per piece basis we will have P16.25/piece. Not bad, right? If the price was good, then the taste was even better! This Revel Bar became an instant favorite because of the controlled level of sweetness and its rich oozing chocolate! Plus, if you are a fan of oatmeal, you will surely love this sweet piece of heaven. And if you are not, well, it won't hurt if you'll try. Oh, also, you have 2 ways of eating this Revel Bar. The first one is eat it fresh from the package. And the other one is to refrigerate it first, then consume. This latter method will enable the chocolate to solidify a bit. So, there! It's a matter of preference. For me, both way was fine but I think I like the chilled one better. Bring some of these goodies to your girl/guy and you will surely make her/his day filled with sweetness!